Well I guess the owners resolved the issue by driving their mobile business off Commercial onto Burrard and into the Downtown core. 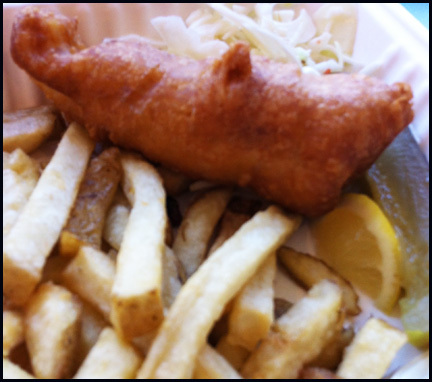 On my first visit, I ordered the one piece Halibut and chips. While waiting, I noticed on their condiment shelf, not only was there the regular suspect of vinegar (white, malt etc) there were some specialty vinegar the Daily Catch had prepared. There were vinegar infused with rosemary, bacon, red onion and a Chipotle vinegar. Upon receiving my order, I immediate squeezed the rosemary, bacon and red onion infusions onto my fries. Of the 3 I really tasted the rosemary vinegar. The red onion had a sweet taste but it could have easily mistaken for a sweet vinegar like red wine. As for the bacon, I think I might of did a misfire on the amount of vinegar that came out of the bottle, as I could barely detect its presence. In just one bite I got faint salty and smoky taste but that was it. 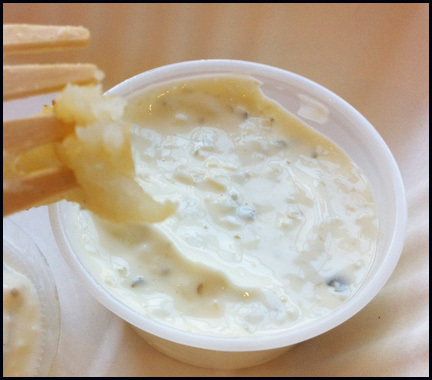 For an order of fish and chips, in addition to the titular items, the Daily Catch also gives you tartar sauce, a wedge of lemon, slaw and a pickle. The Halibut was juicy and not greasy. The fish was prepared well as large pieces flesh flaked off. It was one tasty piece of deep fried fish. The fries were crispy on the outside and soft on inside. The tartar sauce was creamy but it had a predominant onion flavour. It reminded me of the white bulb part of a green onion. The slaw was just shave cabbage, slivers of carrots and red onion. The unusual aspect of the slaw it was not really dressed. It seemed like a toss of the vegetables with the onion flavour standing out. I actually didn’t mind as it was light and refreshing paired against the deep fried items and definitely better than having a heavy slaw dressed in mayo. After such a delicious lunch, I decided to return for another meal to sample their Manhattan seafood chowder and fish tacos. 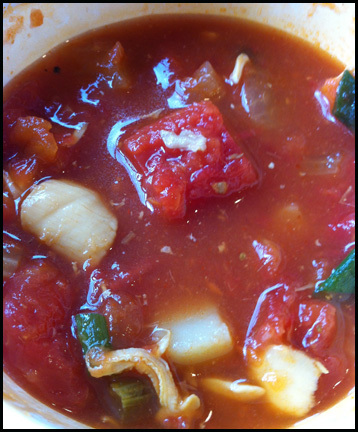 I adore Manhattan Clam Chowder! It’s not as common as its New England cousin and I seek it out when I can. I just prefer the tomato based chowder because it’s just as hearty but feels healthier and it’s more full proof than the cream based rendition. I’ve eaten too many bad New England chowders: heavy and way too thick. The Daily Catch’s has tomatoes, clams, scallops, carrots, celery, onion and of course potatoes. The predominant flavour was the tomato and its tartness. The clams and scallops gave the chowder a briny component. However it needed another flavour to help balance out the sea saltiness and sourness from the tomatoes. I think more potatoes and maybe smoky bacon would have helped. Overall, it was an average chowder and from another point of view a decent vegetable soup. 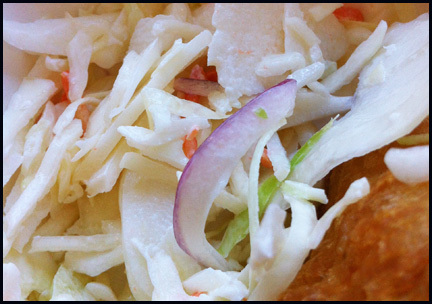 I wish the Daily Catch was around when I did my downtown fish taco rumble. This was a tasty baja style fish taco (http://fooditismorevancouver.blogspot.ca/2013/05/food-rumble-downtown-fish-tacos.html). 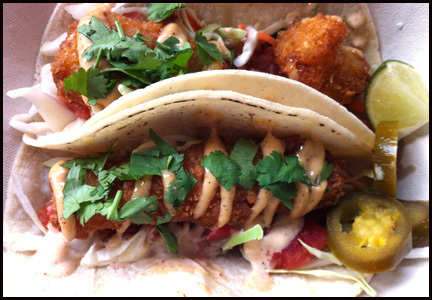 The taco consists of a 6 inch corn tortilla, panko crusted cod, slaw, tomato salsa, Chipotle mayo, pickled Jalapeño peppers and cilantro. I like that they use a corn tortilla, as it provided more texture and flavour than a flour tortilla would. 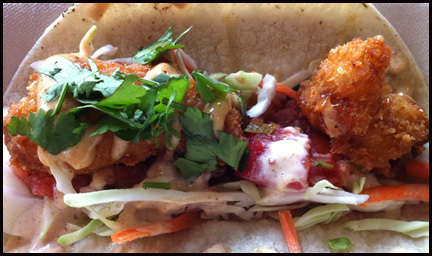 The panko crust cod had a super crunchy exterior allowing it to stand up to the wet ingredients in the taco. Unfortunately the fish was over cooked but I didn’t find it dry due to the mayo and salsa. The slaw gave another layer of crunch and the Chipotle mayo did give a slight kick to the ensemble. The cilantro showed up in some bites as well. I would still award Tacofino the 1st spot but this version was much better than Feastros. After tasting the food from the Daily Catch, I think some of the Drive merchants were afraid of some competition. I for one am very happy that they decide to relocate downtown; one neighbourhood’s loss, is another’s gain. 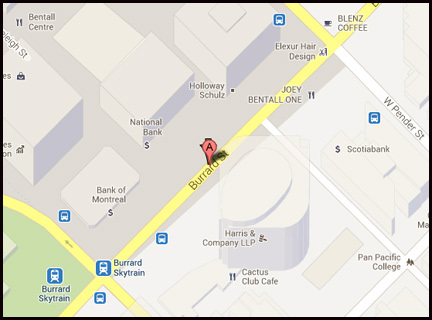 THEY ARE LOCATED ON BURRARD BETWEEN DUNSMIUR AND PENDER! 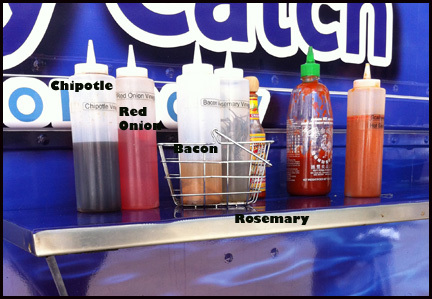 Here’s a map – the Urbanspoon website has their fish store erroneously listed instead of the food truck location. 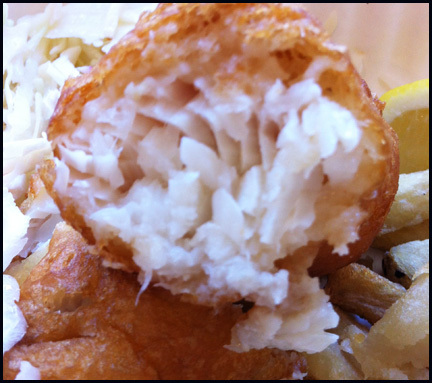 Based on the Street Food Vancouver app, The Daily Catch is open for business 11 am to 2:30pm, I think Monday – Friday.